Looking for a great folktale? This picture book explains the creation of two volcanoes found 40 miles southeast of Mexico City. Expand your teaching to show where Mexico City is on a map, and show photographs of the two volcanoes. Itza is known as “la mujer dormida” and is an inactive volcano. Popo sits next to Itza and has errupted as recently as 2013. Catalog blurb: Daughter of the emperor, Izta has no desire to marry a wealthy, powerful man like she’s supposed to. Instead, she has her eye on Popoca, a warrior. Izta’s father agrees to allow the marriage if Popoca can defeat Jaguar Claw, the ultimate enemy. 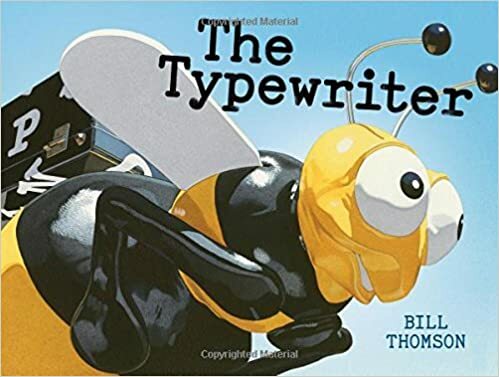 Wordless picture book author/illustrator Bill Thompson (author of Chalk and Fossil) is at it again. This time the kids in the story come across an old typewriter. When they put paper in it and write, the words come to life. Add this to your must-use wordless picture books! You are currently browsing the archives for the Beginning category.